What Is a Cleaning Solvent? A solvent is a chemical compound that can be used to dissolve, soften, melt, or extract another compound. Solvents are divided into two main categories: organic and inorganic. Organic solvents contain carbon, and are commonly used to lift stains, dry-clean fabrics, dissolve paint, and remove glue. Inorganic solvents do not contain carbon and, with the exception of water, are rarely used outside professional research facilities. Water is the world's most common solvent. Chemists rely on the principle of "like dissolves like" to choose the most efficient chemical for any given task, selecting the solvent that most closely resembles the compound they would like to break down. 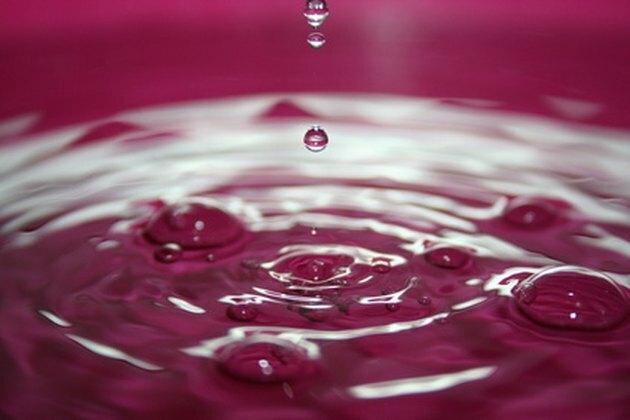 Water is often called "the universal solvent," because it can dissolve both acids and bases. Consequently, most common household chores begin with a thorough washing in warm water. This simple, powerful solvent removes the majority of the dirt and debris from soiled surfaces. Isopropyl alcohol, or rubbing alcohol, is a mild organic solvent. Most commercial formulas contain 70 percent isopropyl alcohol and 30 percent water, making the compound safe for skin contact. As a cleaning solvent, isopropyl alcohol can lift ink stains from clothing or upholstery, remove sticky hair spray from bathroom mirrors, dissolve windshield frost, keep windows frost free in the wintertime, and remove dirt and grime from computer screens and cellular phones. Acetone is a moderately strong organic solvent. More powerful than isopropyl alcohol, acetone-based cleaners must be used with caution because they are flammable and potentially hazardous if inhaled for an extended period. Acetone is the main ingredient in many commercial nail polish removers. In addition to dissolving nail enamel, acetone can remove superglue from hard surfaces and skin, clean up the gummy adhesive left behind by stickers, restore the shine to patent leather shoes, remove abrasions from plastic watch faces, and strip lacquer coatings from brass fixtures. Hexane is a strong organic solvent. Used to create commercial lubricants such as water-displacing sprays, hexane is excellent for loosening zippers and taking the squeak out of rusty hinges. However, hexane is also a first-rate cleaning product. The hydrocarbon base effectively removes stains and spills that will not dissolve in water, such as vegetable oil, grease, crayon and lipstick. As a strong solvent, it must be handled with care. Hexane-based products should only be used in well-ventilated, open areas, and should never be sprayed near open flames or heat sources, because the fumes are toxic and highly flammable.